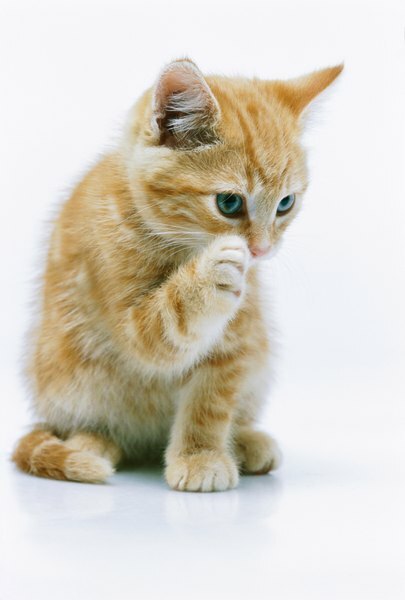 Why Do Cats Lick People's Hair? Your feline is trying to clean you up. After spending a good half-hour bathing himself, your cuddly buddy heads over to you. Without fail, every single time you lay your head on your pillow, Sam comes along and "washes" your hair. Cats lick people's hair for a variety of reasons, but be careful. He could wind up with hairballs. After an intense workout you probably jump in the shower and clean yourself. Sam does the same thing after chasing his catnip-filled balls for long periods of time. He'll lounge in the sun, zone out and give himself a thorough head-to-toe cleaning. Your mischievous buddy licks your hair to clean you off. In his mind he's doing you a favor by getting any bits of dirt and grime out of your hair. Whether you've been at the office all day or simply dashed out to the grocery store, by the time you get home you smell different. Once Sam can get his paws on you, he'll come up and lick your hair. He's coating your head with his scent so that you smell like him. Not only will you smell familiar to him after a solid cleansing, you'll smell like him to other kitties. In case another feline is roaming around, Sam already has you marked, encouraging other cats to stay away. Above all, Sam curls up next to your head and cleans your hair as a sign of affection. These kitty kisses signify that Sam feels comfortable and close with you. He also recognizes you as part of his family and licks you just like he would lick his feline cousins. Show Sam a little love in return by offering him a solid petting session, or interact by dangling his favorite toy in front of him. After all, he did just give you a bath. Although Sam is simply trying to clean you and show you affection, it might not be the best idea to allow him to lick your head. If you use a lot of hair products, such as gel or mousse, you don't want your furry friend ingesting these chemicals. Additionally, if he swallows your hair it can contribute to hairballs. He'll arch his back, press his neck towards the floor and retch until the undigested hair comes out. An occasional hairball is not harmful, and your feline should be able to get the hair out on his own. But if he's vomiting hairballs more than a couple times a month, it might be time to take him to the vet to find a solution. What Does It Mean When a Cat Nibbles on Your Head? Does a Hairless Cat Have Hair? Does Cats' Hair Get Matted When It Is Dry? Why Do Cats Sleep on Your Neck & Face?